A year ago, I didn’t know squat about fashion or design. 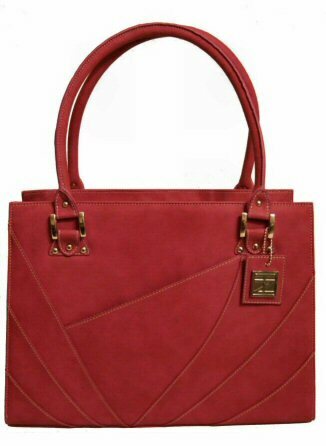 I keep repeating this, but it’s true–a year ago when I declared to my husband, to my parents, to friends that I wanted to design handbags and launch my own line, I heard chuckles, typically followed by a snarky comment. Well I’d like to play in the NBA. / And I want to fly to Jupiter on the wings of a purple dove. Good luck to us both? The chuckling was legitimate, I admit, because I really didn’t know squat about fashion or design. So I set about learning. I had some idea of the designs I wanted to make, but did not possess the skills to communicate and express those designs to others. The Internet is a treasure trove of information, especially for the wannabe fashion designer. And yet I could not find any concise explanation of the different kinds of sketches or even what needs to go into the sketches that I’d submit to…and on that note, who would I submit these sketches to? No, seriously, what in the heck is Step 1? That’s how lost I was. As this year (of so much learning) comes to a close and 2011 begins with official production of our debut collection, I’d like to offer in a nutshell summary what I’ve learned so far about fashion design illustration. There are 3 main types of design drawings the would-be designer works on: (1) thumbnail sketches, (2) fashion illustrations, and (3) technical drawings. Based directly on my own experiences, I’ll explain each type and what I’ve used each type for. This post is targeted at the entrepreneur, the budding designer launching his or her own line, and not so much for the designer working at a big label. Of course, a disclaimer: I have no idea whether I’m right on any of this; but so far what I’ve been doing has been working for me. My hope is that the would-be designer in the same position I was in a year ago can take the notes here plus notes found in dozens of other sources and formulate his or her own custom approach. 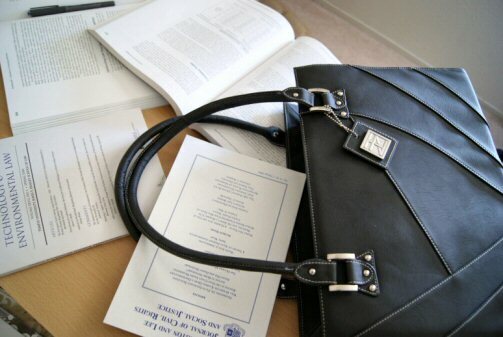 I’m using The Workaholic shoulder tote as a case study. First, see above photo for the final product. This product began with a thumbnail sketch. In designer speak, a thumbnail sketch is a quick freehand sketch of an idea, and is usually found in the context of many quick freehand sketches, a group of messy doodles that track the evolution of a design conception. The first sketch rendered was the top left one, the cleanest doodle, though also the first conception to get trashed. That first sketch established 2 main points I kept: I wanted to design a shoulder tote and I liked that curved pleating pattern thingie you see going on at the bottom half of that first conception. Once I finished that first conception sketch, I realized the handle base looked like crap, so I rendered a quick sketch to express another idea. The sketches can almost be read like a book, top to bottom, left to right. You see the progression of the conception until finally I hit a conception I like. I’ve highlighted it with a purple box. 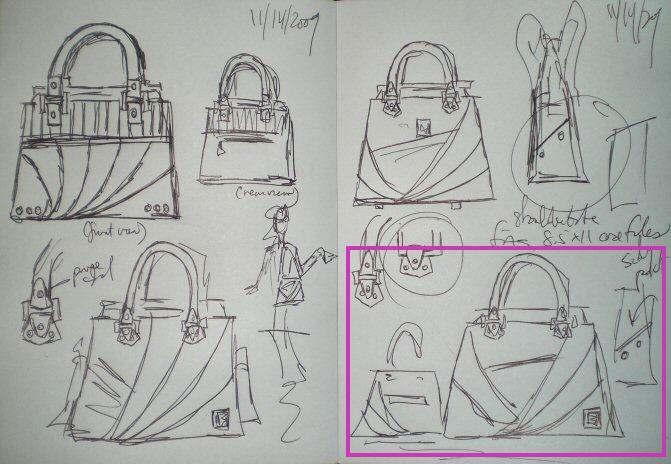 That’s the first thumbnail sketch of the Workaholic shoulder tote, done on 11/14/2009. It’s a good idea to date all your sketches, by the way. A designer’s sketchbook will be filled with thumbnail sketches. I confess that when I first started, I was afraid to draw thumbnail sketches. Doesn’t that sound odd? What I mean is I was afraid to draw crappy stuff in my sketchbook. I felt (irrationally so) that whatever I committed to paper better be perfect. And that sentiment disabled my creativity. You cannot be afraid to draw crap. 100% of my thumbnail sketches look like crap, but I got over it real quick. And you will have to, too. Thumbnail sketching is about the conceiving of a design idea, not about art. The art is in your design, not in the actual sketch. Next there is the fashion illustration. Fashion illustration itself used to be a profession. I mean, it still is. Just not what it once was. Advertisements used to be spreads of beautifully drawn fashion illustrations, some traditional with impeccable detailing and others more abstract and modernist, with elements of cubism. Fashion illustration was an art form. Fashion illustrations by Mats Gustafson, circa 1980s. 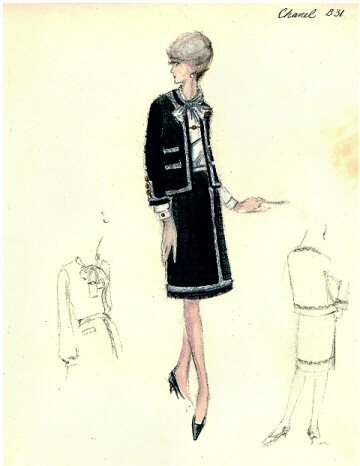 Fashion illustration of a figure in a Chanel suit. Sketch rendered in pencil. Showcased at the Fashion Institute of Technology, Department of Special Collections. 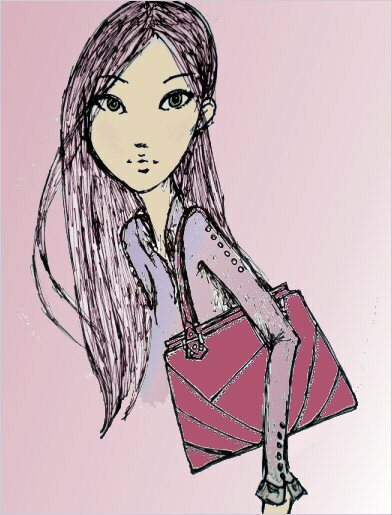 A fashion illustration is a detailed drawing of a fashion design, usually in full color, used to communicate a design idea to third parties. There used to be full page spreads of fashion illustrations in magazines such as Vogue, and in RTW retail advertisements. Commercial art at its absolute finest. 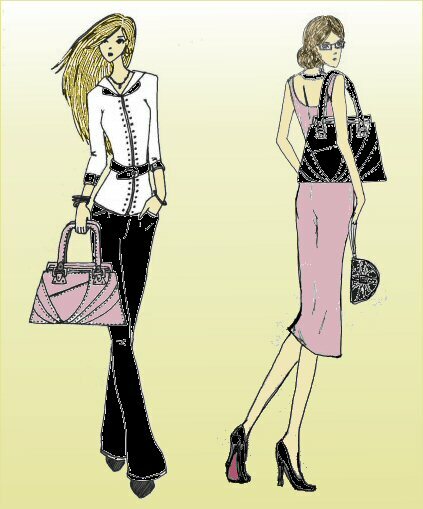 These days fashion illustrations are generally used to show a collection to a prospective buyer or retailer. I’ve met buyers who are immensely interested in seeing my fashion illustrations, even when I have glossy photos of the product or the actual samples with me. Thus, they’re handy to have in your portfolio. 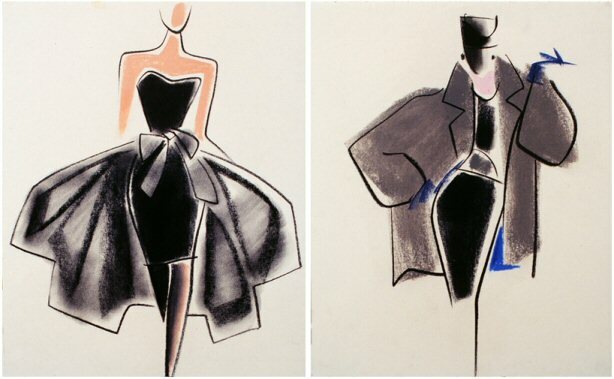 Fashion illustrations with figures make more sense when you’re designing clothes. 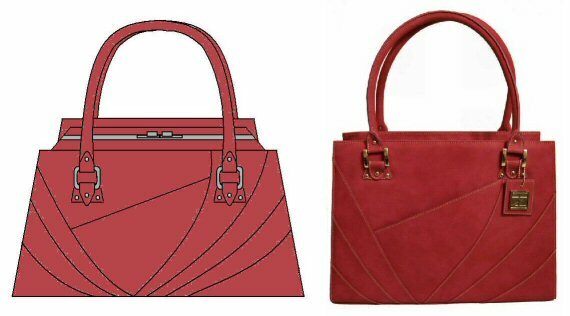 With accessories it’s kind of extraneous, but I like contextualizing my handbag designs with women. That’s why I do figure drawings with my designs. Another modern day purpose for fashion illustrations: if your line will be funded by a private investor or venture capitalist, then it makes sense to have a full portfolio because you may likely be presenting the illustrations as part of your pitch. 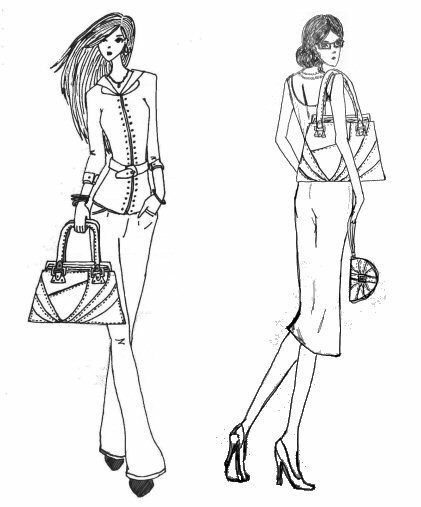 The fashion illustrations is what’s going to get you your funding for line production. Taryn Zhang is not currently funded by such folks. So what are my fashion illustrations for? For Hubby, of course. In more formal speak, they’re for my business partner (who I happen to be married to). I like to run my ideas by him to get a second opinion. He’s definitely not artsy, so if I showed him thumbnail sketches, he’d be thoroughly confused. Thus, I clean up my thumbnail sketches into a fashion illustration and show it to Hubby. 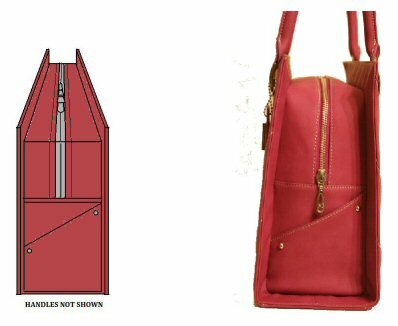 They become the basis of his “Like” or “Dislike.” For example, Hubby “Liked” the Workaholic shoulder tote after seeing my fashion illustrations of the design. I know, her head is too big. Oh well. That was just for kicks. Moving on to the third and final type of sketching, the technical drawing. Once I’ve committed to a conception, I need to prepare the technical drawings, which will be submitted to my manufacturer in packets that I refer to as Spec Briefs because (a) they contain the specs for my design and (b) they remind me of the briefs I write for work (as a lawyer). 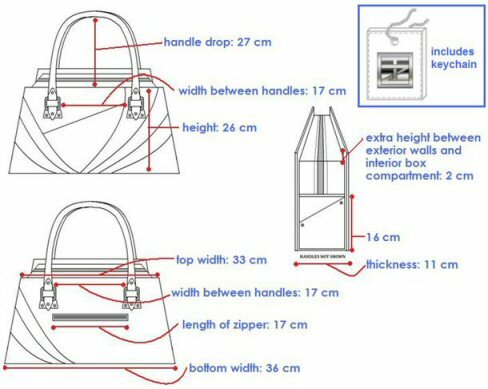 Sample prototypes of the bag will be made based on my technical drawings. 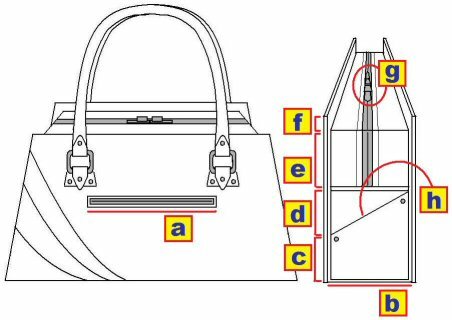 Technical drawings are to-scale delineations of a fashion design accompanied by measurements, proportions, and/or instructions for prototype- and sample-making. A manufacturer will use your technical drawings to create your first samples. The above technical drawings for the Workaholic have letter designations because the drawings came with a table of information. The table of information explains in detail the patterns and other instruction for making the bag. All of the technical drawings pictured here were rendered in MS Paint, Version 6.0. Most designers use sophisticated software programs for technical drawings. I’m too cheap to invest in such software. Plus, I’ve been using Paint since grade school, so Paint is what I stick with. 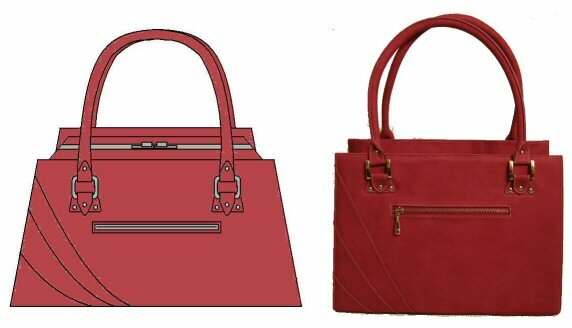 Drawing handbags in MS Paint gets quite tedious, and if you can’t keep a steady hand, then I recommend using something else, like one of those sophisticated fashion design software programs, or even Adobe Photoshop. The base of the actual bag doesn’t flare out as much as the original design in the technical sketch, but I ended up liking the more squarish silhouette. That, by the way, is another lesson. Oftentimes the actual sample will come out with significant discrepancies from your technical drawings. Some discrepancies I can make peace with; but when I can’t, we have to start the samples making process all over again. Hence prototype after prototype gets made until we get something I like. This blog has covered the various incarnations of our bags, from eyesore-awful first versions to not-so-bad-but-far-from-perfect second and then third versions, and then the finals that we end up sending to production. I always have a sketchbook with me and whenever I’m tickled to, I’ll whip it out and do split second thumbnail sketches. Tons of them. I’ve learned to not care whether they’re any good or not; just get every flash of an idea down on paper, stat. Then when I have time, I weed through them for good ones and turn those into cleaned up fashion illustrations, which I then show Hubby so we can combine both our brains and sensibilities. His taste is more marketable. I like stuff that’s pretty out there, so he provides a necessary balance. Once we’ve decided on a set of designs, I do the technical drawings and prepare the spec briefs for each design. Other designers may start with the thumbnail sketching, then do technical drawings to get down the specs, and then once a design is set, work on fashion illustrations to show off their designs. That’s a very plausible process. For me, my order has been thumbnail sketching, fashion illustrations (usually private doodles shared between Hubby and me only, or at times posted on this blog, see categories/sketches-sw), and then once my business partner and I agree on a design, I proceed with technical drawings to be submitted off to our factory. And that, in a nutshell, is how one materializes a pipe dream. This entry was posted in Business Development, Design Conception, Learning Curve, Progress, Sketches SW. Bookmark the permalink. You are a good artist ! Also, you look Great . I hope someone out there will find it useful! =) And thanks. My favorite teachers in school always turned out to be the ones I was afraid of *while* I was taking their course. Only in retrospect do I realize how much I actually learned from them! Hopefully I’m not as intimidating. Thanks! Too kind! Actually, I’m a mediocre artist. But that’s okay. This was super interesting to read (I can’t believe all the technical expertise that has to run alongside the creative inspiration in order to actually fully design something) – kudos to you! It was surprising to me too how much tech and “left brain” work was involved in an endeavor that I had always presumed was wholly “right brain.” Love your blog, btw!! Very interesting post! 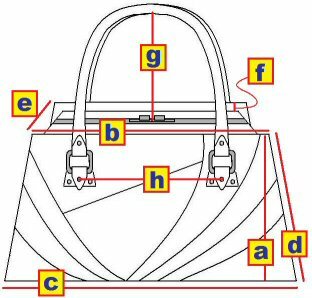 I love how you set out to accomplish your goal of becoming a handbag designer through hard work and careful study. Best of luck to you 2011 as you reach new heights in your career, Sunny. I totally admire you for everything you’ve done! I can’t believe it just started with a dream a year ago and now you have these beautiful bags. And yes, the Victoria Beckham bags are totally drool worthy and so crazy expensive that I can’t imagine how anyone could afford them! REALLY wish I could draw and do what you do! Thanks so much for your comment on my blog!!! HAPPY NEW YEAR!! Wow you did great job well with this bag darling.. Same here re: the technical drawings! Plus, stuff that looks great in the disproportionate freehand sketches suddenly look awkward and awful in the scaled technical drawings. =/ Always something I need to reconcile. Thanks Amy! =) The fashion on your blog is yummy! Thanks for all the support from A.C., Cath! Yes, the Victoria Beckham bags are crazy expensive but – oh – I can see people still rushing to buy them anyway! =P Does kind of make you wonder what exactly is the cost of goods that justifies the price tag! And your blog and photos have definitely been an appreciated source of inspiration for me on the blogosphere. Thanks! you are seriously amazing and have accomplished sooo much in such a short time… i think your blog is amazing and provides such great inspiration for someone who wants to learn and start something out of their realm. I hope this blog does that! It’s the blog I wish existed back when I first started this endeavor. =) And btw, I’m so glad I did start blogging; because otherwise I would never have stumbled across your fantastic style and OOTD blog! Hey thanks for dropping by my blog Sunny! I love that you’re making your dream come true! I love entrepreneurship and for me it is still a long journey but seeing others become successful is such an inspiration! : ) Thanks for following my blog. Can’t wait to read more! This is super informative and so good to know. Thank you! I’ve been drawing in a sketchbook for a few months now with whatever designs come into my mind and now I realize that I’ve only done a thumbnail sketch. I don’t think I am skilled enough to do the latter two! Haha. You are great at what you do and it is awesome that you’ve followed your dreams. All the best for the future of your handbag line! Considering you have no formal training, I think your sketches are pretty damn good. You’ve done so much research (it’s in your character to be very thorough), and learned how to make something happen. I love the last sentence, “And that, in a nutshell, is how one materializes a pipe dream.” It’s so…brilliant! Sunny, it’s been so fun to watch your progression! And I feel like I’ve learned so much through your process. 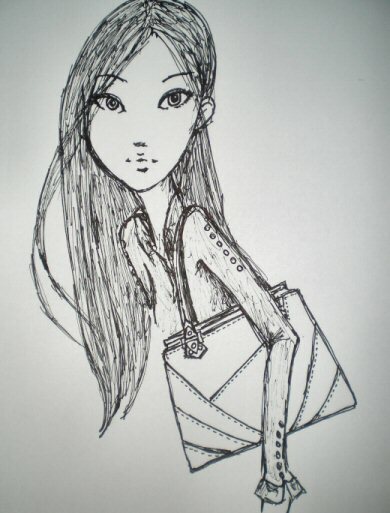 Your sketches and your bags are just gorgeous!! !